In the heart of Edinburgh and close to the Royal Mile, you can find two famous museums of Scotland. One among them is the Royal Museum of Scotland built in 1861 in the style of an Italian palace. Designed by Captain Francis Fowke of the Royal Engineers, this Victorian building has slim, elegant cast iron pillars and a glass roof. The museum houses a collection of items ranging from Classical Greek sculptures to stuffed elephants, from whale skeletons to Native North American totem poles. The Royal museum of Scotland is a treasure trove of fine Scottish treasures. The Royal Museum of Scotland displays the communal drinking cup (Bute Mazer) as well as the jewelry, coins and medals that once belonged to Mary Queen of Scots. 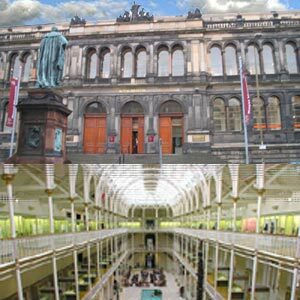 The collection housed in the Royal Museum of Scotland also includes European and Oriental ceramics and metal work, Egyptology and primitive art. What strikes a visitor to the Royal Museum of Scotland is the 'bird cage' design. With natural light streaming into the Hall, the overall feeling is one of light and space when combined with the beech interior. This museum in Edinburgh was started off as an 'industrial' museum. The exhibits within the museum include the Wylam Dilly - the oldest steam locomotive dating back to 1813. The Royal Museum is also home to a wide range of Scottish minerals, crystals and fossils from all around Scotland. These include a collection of Hugh Miller, a pioneering geologist.